Mohamed Beji Caid Essebsi (or es-Sebsi; Arabic: محمد الباجي قائد السبسي‎, translit. 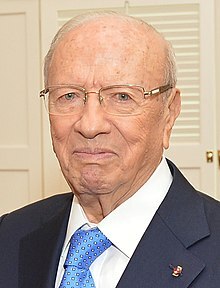 Muhammad al-Bājī Qā’id as-Sibsī, pronunciation (help·info); born 29 November 1926) is a Tunisian politician who has been the fifth President of Tunisia since December 2014. Previously he served as Minister of Foreign Affairs from 1981 to 1986 and as Prime Minister from February 2011 to December 2011. Beji Caid Essebsi in 2015. Essebsi is the founder of the Nidaa Tounes political party, which won a plurality in the 2014 parliamentary election. In December 2014, he won the first regular presidential election following the Tunisian Revolution, becoming Tunisia's first freely and directly elected president. Promotion photo at Sadiki College featuring (Caid Essebsi, 2nd row, circled on the right). Born in Sidi Bou Said to a family from the Tunisian landed élite, he is a great-grandson of Ismail Caïd Essebsi, a Sardinian kidnapped by Tunisian corsairs along the coasts of Sardinia at the beginning of the nineteenth century who became a mamluk leader raised with the ruling family after converting to Islam. He was later recognized as a free man when he became an important member of the government. Essebsi married Chadlia Saïda Farhat on February 8, 1958. The couple have four children: two daughters, Amel and Salwa, and two sons, Mohamed Hafedh and Khélil. Essebsi is currently 92 years old and is the third-oldest current head of state after Elizabeth II of the Commonwealth realms, thus making him the 2nd oldest democratically elected state leader in the world after Tun Mahathir Mohamad. Béji Caïd Essebsi with Secretary-General of the United Nations, Dag Hammarskjöld, in 1961. Essebsi's first involvement in politics came in 1941, when he joined the Neo Destour youth organization in Hammam-Lif. He studied law in Paris and became a lawyer in 1952 at the Tunis bar, where he began his career with the defence of Neo Destour activists. He was a follower of Tunisia's post-independence leader Habib Bourguiba. He then joined Bourguiba as an adviser following the country's independence from France in 1956. From 1957 to 1971, he performed various functions such as director of the regional administration, general director of the Sûreté nationale, Interior Minister from 5 July 1965 to 8 September 1969, Minister-Delegate to the Prime Minister, Defence Minister from 7 November 1969 to 12 June 1970, and then Ambassador in Paris. From October 1971 to January 1972, he advocated greater democracy in Tunisia and resigned his function, then returned to Tunis. In April 1981, he came back to the government under Mohamed Mzali as Minister of Foreign Affairs, serving until September 1986. In 1987, he switched allegiance following Ben Ali's removal of Bourguiba from power. He was appointed as Ambassador to Germany. From 1990 to 1991, he was the President of the Chamber of Deputies. Béji Caïd Essebsi with Habib Bourguiba, (Carthage Palace, 1965). On 27 February 2011, in the aftermath of the Tunisian Revolution, Tunisian Prime Minister Mohamed Ghannouchi resigned following a day of clashes in Tunis with five protesters being killed. On the same day, acting President Fouad Mebazaa appointed Caïd Essebsi as the new Prime Minister, describing him as "a person with an impeccable political and private life, known for his profound patriotism, his loyalty and his self-sacrifice in serving his country." The mostly young protesters however continued taking their discontent to the streets, criticizing the unilateral appointment of Caïd Essebsi without further consultation. On 5 May accusations of the former Interior Minister Farhat Rajhi that a coup d'etat was being prepared against the possibility of the Islamist Ennahda Party winning the Constituent Assembly election in October, again led to several days of fierce anti-Government protests and clashes on the streets. In the interview disseminated on Facebook, Rajhi called Caïd Essebsi a "liar", whose government had been manipulated by the old Ben Ali circles. Caïd Essebsi strongly rejected Rajhi's accusations as "dangerous and irresponsible lies, [aimed at spreading] chaos in the country" and also dismissed him from his post as director of the High Commission for Human Rights and Fundamental Freedoms, which he had retained after being dismissed from the office as Interior Minister already on March 8. Nevertheless, Ennahda's president Rached Ghannouchi further fueled the suspicions, stating that "Tunisians doubt the credibility of the Transitional Government." After the elections in October, Caïd Essebsi left office on 24 December 2011 when the new Interim President Moncef Marzouki appointed Hamadi Jebali of the Islamist Ennahda, which had become the largest parliamentary group. Following his departure from office, Caïd Essebsi founded the secular Nidaa Tounes party, which won a plurality of the seats in the October 2014 parliamentary election. He was also the party's candidate in the country's first free presidential elections, in November 2014. On 22 December 2014, official election results showed that Essebsi had defeated incumbent President Moncef Marzouki in the second round of voting, receiving 55.68% of the vote. After the polls closed the previous day, Essebsi said on local television that he dedicated his victory to "the martyrs of Tunisia". Béji Caïd Essebsi with U.S Secretary of State John Kerry (September 19, 2016 in New York City). Essebsi was sworn in as President on 31 December 2014 at the age of 88. He vowed on that occasion to "be president of all Tunisian men and women without exclusion" and stressed the importance of "consensus among all parties and social movements". On 3 August 2016, Essebsi appointed Youssef Chahed as a prime minister as the parliament withdrew confidence from Habib Essid's government. In 2017 he called for legal amendments to the inheritance law to ensure equal rights for men and women, and he called for Tunisian women to be able to marry non-Muslims, which he believes is not in direct conflict with Sharia or the Tunisian constitution. In 2018 he proposed a revision of the electoral law which, according to him, contains many shortcomings going against the principles of the revolution. On 13 August 2018, he promised also to submit a bill to parliament soon that aims to give women equal inheritance rights with men, as debate over the topic of inheritance reverberated around the Muslim world. Béji Caïd Essebsi on the cover of the magazine Tunivisions, January 2012. ^ Sayed Mohamed Mahdi al Tajir, The International Who's Who of the Arab World (1978), page 137. ^ "Tunisian PM Mohammed Ghannouchi resigns over protests", BBC News, 27 February 2011. ^ "Annuaire des Personnalités: Béji Caïd Essebsi". Leaders.com.tn. 2015-09-19. Archived from the original on 2018-08-31. Retrieved 2019-03-23. ^ "Les premières déclarations de la Première Dame de Tunisie, Chadlia Saïda Caïd Essebsi". Baya.tn. 2015-01-08. Archived from the original on 2018-08-28. Retrieved 2019-03-23. ^ a b c "President Essebsi, a lifetime in Tunisia politics". Euronews. 22 December 2014. Archived from the original on 22 December 2014. Retrieved 22 December 2014. ^ "Essebsi retrouve ses racines à Hammam-Lif!" (in French). Espace Manager. 20 October 2014. Archived from the original on 24 December 2014. Retrieved 24 December 2014. ^ Guidi, Francesco (1 March 2011). "Tunisian Prime Minister Mohammed Gannouchi resigns". About Oil. Retrieved 13 November 2014. ^ a b Guidi, Francesco (9 May 2011). "Tension returns to Tunisia with protests against the Transitional Government". About Oil. Retrieved 13 November 2014. ^ «Farhat Rajhi fonce, tête baissée, pour l'élection présidentielle», Business News, 6 May 2011. ^ "Tunisia's Essebsi: The 88-year-old comeback kid". 2014-12-31. ^ Monica Marks (29 October 2014). "The Tunisian election result isn't simply a victory for secularism over Islamism". Archived from the original on 3 November 2014. Retrieved 9 November 2014. ^ "Essebsi elected Tunisian president with 55.68 percent". Reuters. 22 December 2014. Archived from the original on 22 December 2014. Retrieved 22 December 2014. ^ "Tunisia election: Essebsi claims historic victory". BBC News. 22 December 2014. Archived from the original on 22 December 2014. Retrieved 22 December 2014. ^ "Tunisian secular leader Essebsi sworn in as new president", Reuters, 31 December 2014. ^ "How the new government plans to save Tunisia". Al-Monitor. 2016-08-18. Retrieved 2017-01-02. ^ "We are an example to the Arab world': Tunisia's radical marriage proposals". 2011-11-28. Retrieved 2017-09-04. ^ "Pourquoi Béji Caid Essebsi veut faire amender la loi électorale". 2018-03-23. Retrieved 2018-04-04. ^ "Tunisian president backs inheritance equality for women despite opposition". 2018-08-03. ^ "Viewpoint: President Beji Caid Essebsi, President of Tunisia". 2018.